God has implanted within us an Original Goodness that, when spiritually nurtured, beings forth spiritual completeness, peace, and joy. It is our task to bring out the talents within us, and use them in a Godly manner. When a group of men were given money, one buried it, two others invested it. Those who used their money for good were praised. The one who hid their money and did nothing with it was condemned for not using the gifts he was given. We, too, must use wisely the gifts we are given. And while all of us are flawed, and imperfect, we cannot hide behind this as an excuse for inaction. All our gifts and abilities come from God. We ought never downplay, degrade or disparage those abilities by saying that they are not good enough to do what God asks us to do. Nor must we pray to God, telling Him that it is HIS job to do the Good Works He calls on US to do. By asserting that we are somehow unable and ill-equipped to perform them, we take an ungrateful attitude to our Creator's ears. And we must never do that. God, therefore, doesn't exist to do these things for us. Instead, He gave us the ability to act and do Good on His behalf, and the ability thru Jesus' teachings to know what is Good and Right. Jesus, the Spokesman of God, and our Example and Template in all things, asks us to use our God-given gifts to act in the service to others. Jesus preached a Gospel of doing Good Works of Righteousness in humility, seeking to establish God's Kingdom here and now, upon this earth. Jesus calls on us to love God with every fiber of our Being, to deny ourselves, put others first, and love our neighbors just as we love ourselves. 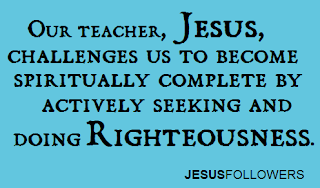 Our Teacher and Master, Jesus, challenges us to become spiritually complete by actively seeking and doing Righteousness. THAT is the Gospel Jesus preached, and he challenges us today to take on his Gospel of Good Works, service, and love of others. 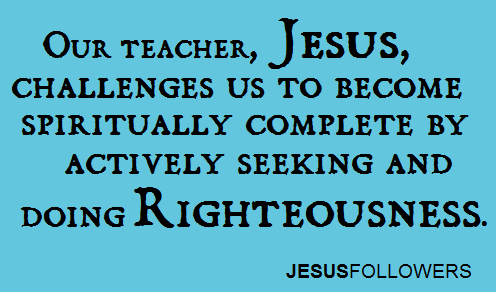 And we are well equipped to do this, because this man, Jesus, said that we have the ability to do all the he did. And in all that he did, he pleased God. Our hope doesn't rest in the idea that God is going to do things to make us materially successful. It rests in the knowledge that God gave us the ability to succeed, spiritually, whether we successful or not in our current material endeavors. What a great hope and comfort that is! We ought to be grateful for the abilities God has given us, and while thanking God for them, ask Him to continue granting us the spiritual strength, comfort, and, encouragement that will sustain us thru our lifelong journey.